What can we say about Elvis Presley that has not been said a million times before?! Here at AVID Entertainment we have resisted the temptation to release an Elvis album while other lesser rivals have hastily thrown together compilations to cash in on the great mans historic legacy! We feel we have now waited long enough and the time is right for a well thought out and professionally engineered compilation to sit at the head of our highly successful Essential Series. We are proud to present a fully re-mastered Essential Elvis collection containing six LPs plus an E.P plus an assortment of singles covering pretty much his entire commercially recorded music up to the end of 1957. How about that! And whats more you will be able to hear a little more detail and natural sound quality courtesy of AVIDs in house engineering team. 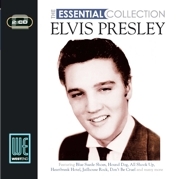 All the early classics are here from Blue Suede Shoes to Hound Dog, Heartbreak Hotel and All Shook Up to many Sun Studios classics and a smattering of his early gospel songs. Indeed something for all Elvis fans and in superb re-mastered sound quality. 28. Got A Lot O Livin To Do!